Our goal at Prairie Village Animal Hospital has always been to assemble a veterinary health care team committed to providing exceptional client service and veterinary health care. Our team displays an unrivaled commitment to our clients through continuing education, technological advances in veterinary medicine and service, and most importantly, administering compassionate care to all pets entrusted to us. The friendly, professional staff at Prairie Village Animal Hospital is made up of dedicated individuals who have made it their mission to help pets live long, healthy lives. 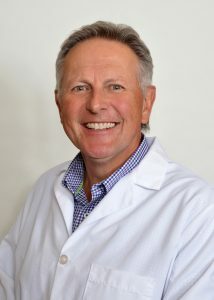 Dr. Mark G. Daly grew up in Garden City, Kansa, graduating from Garden City High School in 1971, and then attended Kanas State University, where he received his D.V.M. in 1977. His love for animals and interest in veterinary medicine began when he started working with large animals, alongside his father, who was a cattleman and the owner of feedlots in Western Kansas. Upon graduation, Dr. Daly joined Prairie Village Animal Hospital and later became a partner with the founder of the practice, Dr. George Gates. Dr. Daly is proud to continue the mission of PVAH along with his dedicated associates, Dr. Ripperger, Dr. Wilcox and Dr. Edmiston; to provide the Kansas City community with exceptional veterinary care and personal attention to pets and their owners. When away from the animal hospital, Dr. Daly, along with his wife Patty, enjoys spending time with their three daughters, son-in-laws, and grandchildren. He is a devout sports fan, loyally following the Wildcats and Chiefs. He can be found relaxing by playing golf or traveling, often to warm, beach climates. Dr. Scott Ripperger grew up in Grandview, Missouri, graduating from Grandview Senior High School in 1985, he grew up with multiple hunting dogs from Hobo the beagle to Chip the english pointer, hunting them with his father. Upon graduation, he attended and graduated from the University of Missouri, Kansas City at which point he pursued a career in information technology. In 2005, Dr. Ripperger decided to reenter academia to pursue his passion for animal health receiving his D.V.M from Kansas State University in 2011. After graduation he worked at an animal clinic in Kansas City, KS. In 2015, Dr. Ripperger joined the veterinary team at Prairie Village Animal Hospital. When away from the animal hospital, Dr. Ripperger enjoys spending time with his nieces and nephew. He also enjoys most outdoor activities including kayaking, mountain biking, hiking and camping. 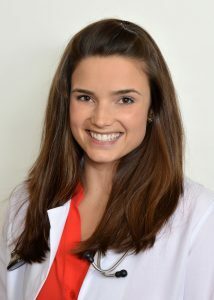 Dr. Morgan Matile Wilcox grew up in Bucyrus, Kansas. She attended Blue Valley High School. Dr. Wilcox has a B.S. in Biochemistry from Oklahoma State University and a D.V.M. from Kansas State University. Morgan’s participation in Johnson County 4-H fostered her love of animals from a very young age. While in high school, Morgan worked at Land of Paws South. This is where she found her first love, Tuff, a wheaten/cocker spaniel mix. During summer breaks from college, Morgan worked as a veterinary assistant at Prairie Village Animal Hospital. Dr. Gates and Dr. Daly were instrumental in mentoring Dr. Wilcox through veterinary school. 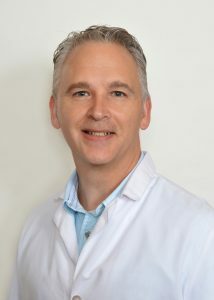 Upon graduation, Dr. Wilcox worked at another hospital in the Kansas City area. In August of 2016, Dr. Wilcox joined Prairie Village Animal Hospital as an associate veterinarian. She has enjoyed working with her PVAH family to provide high quality care. Morgan lives in Prairie Village with her husband, Nick. They have two dogs, Tuff and Leroy (a Pomeranian mix that Morgan rescued while at KSU). They also have a cat named Hester that they rescued and bottle raised. When not at the hospital, Dr. Wilcox enjoys spending time with her family, friends and pets. During her free time, she can be found hiking with her dogs, biking, practicing yoga and baking. 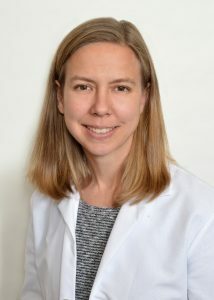 Dr. Krista Edmiston attended the University of Kansas and Kansas State University, where she earned a D.V.M in 2004. Following several years of practice in Kansas City, Dr. Edmiston formed her own business, Relief Veterinary Services, to provide veterinary care at animal hospitals and clinics needing veterinarians short-term. This work provided her with an opportunity to work with dozens of other veterinarians in a variety of settings. She provided veterinary care through this business in Denver for over a year before returning to the Kansas City area, where she continued her relief practice before joining the staff of PVAH in 2016. Dr. Edmiston currently lives in Overland Park with her husband and four small children. Her home also includes three furry kids, Sushi a small yet busy terrier and two cats, Smay and Tuxie. In her spare time, she enjoys spending time with her family and trying different restaurants around Kansas City. Centrally located in Prairie Village, Kansas- our facility offers free parking with easy access to the hospital. Behind the scenes, our exam rooms and labs offer our clients the latest technologies with a focus on providing your pet with the quickest diagnosis.